In need of a Drain Cleaning Service in the Washington DC Metro area? 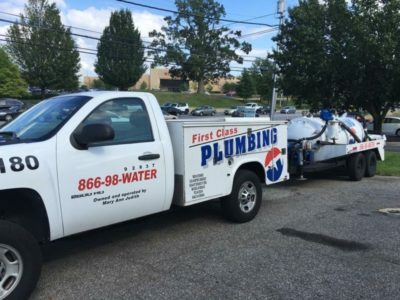 If your home drains, bathroom drains, kitchen sink drains, or restaurant drains are clogged First Class Plumbing can help. Our local plumbers are skilled and experienced licensed drain technicians, who are certified specifically in drain cleaning. Our drain cleaners can snake all types of residential, commercial, and restaurant drains. We are a full service drain company, offering emergency drain cleaning service 24/7 to both residential and commercial clients. All work is guaranteed. Clogged drains or slow drains can be a real problem. Call in the professionals to get your home or business back to normal quickly. Backflow prevention is crucial to keep pollutants from reversing back into the water system. We install backflow preventers in a variety of locations to prevent backflow and cross connections. Our specialized training in drain cleaning makes us the first choice for many homeowners and commercial businesses. We clean sewers and drains right the first time. We use high velocity water jetting to get to the root of the problem. We offer service contracts to help keep your drainage system at peak performance.